The children manipulate colored inks on the surface of water to make Suminagashi prints. For ages 9 to 13. Plan 1 to 2 sessions. 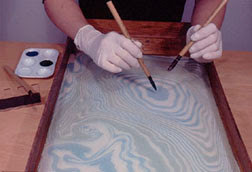 Click here to see a film showing a Japanese master making a Suminagashi print. Suminagashi (sue-me-NAH-gah-she) literally means “floating ink” and is an ancient form of Japanese marbling dating back over 800 years. 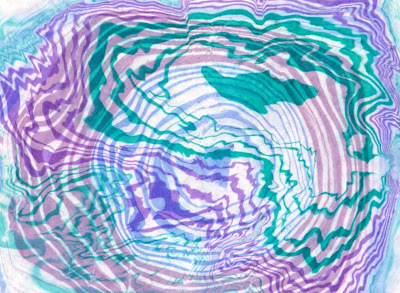 Colored inks are floated on a bath of clear water and then gently manipulated into delicate patterns. 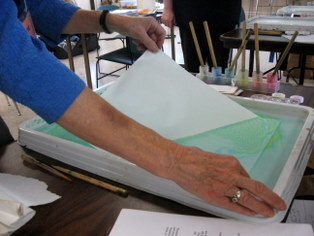 Paper is carefully laid on top of the water to absorb the colors and then lifted. 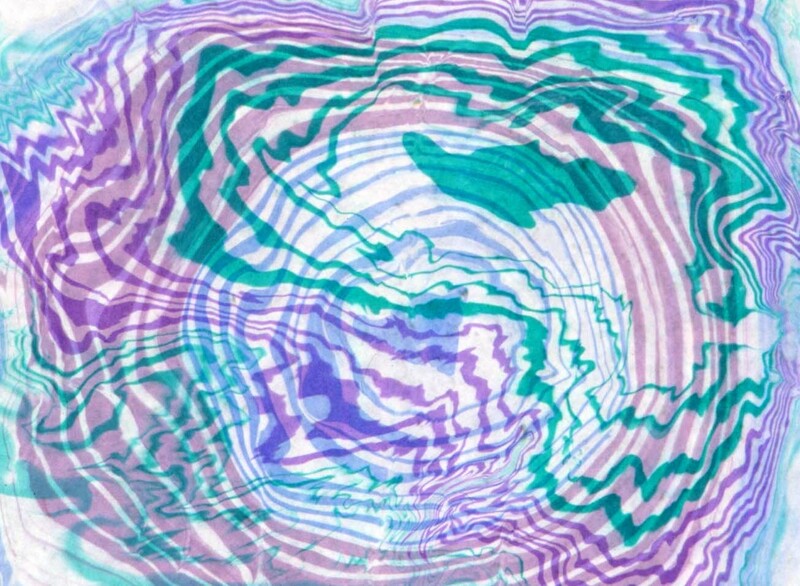 This is a form of monoprinting where no two prints will be exactly the same. Note: Although a variety of absorbent papers can be used, each will work differently and must be experimented with ahead of time. In this lesson, Art Advantage Oriental rice paper was used. 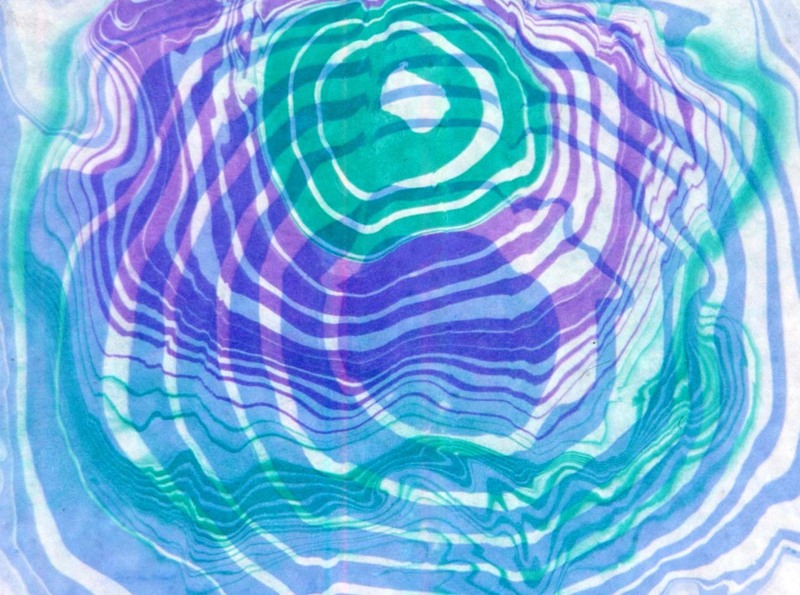 Since rice paper is somewhat transparent, the dried prints were backed with white paper to bring out the colors. Copper plate paper, which comes in large sheets that can be cut into smaller pieces, absorbs the colors well, but is considerably more expensive. Cut newspaper strips to use for cleaning off excess color after a print is made. The strips should be two inches wide and the length of the tray being used. Pour the colored inks into small containers. Test that each color will spread sufficiently by dipping a brush into the color and touching the surface of the water. The color should spread into about a three-inch circle. If it doesn't, add a single drop of the Photo Flo dispersant and try again. Work carefully because if too much Photo Flo is added, the color will sink to the bottom of the tray. Usually the pigmented drawing inks and the Boku Undo colors will spread without the Photo Flo. Cut the printing paper to fit easily inside the tray and test that it absorbs the colored inks. Make a dispersant by adding one drop of Photo Flo to one teaspoon of water. Set out the containers of colored inks and dispersant, placing one brush with each color and one with the dispersant. Set out trays, paper, and newspaper strips. Tell the children about the Japanese art form of Suminagashi where colors are floated on water to make prints. Explain that this is a form of monoprinting and no two prints will be the same. 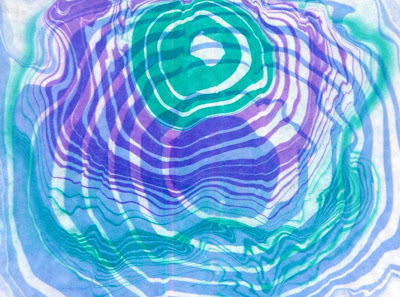 In this session the children will be taking turns making their own Suminagashi prints. Demonstrate how to do Suminagashi. Fill a tray with one to two inches of water. With a newspaper strip, skim the surface of the water to remove any dust and to help still any movement in the water. Dip one brush into a color and one brush into the dispersant which is used to drive the color into a ring. Tap off any drips against the edges of the containers. With one brush in each hand, rest the arms on the sides of the tray and touch the surface of the water delicately with the color-loaded brush. Do not submerge the whole brush–just touch the tip onto the water surface. Then touch the center of the circle with the dispersant brush. The dispersant solution will propel the circle of color into a large ring. Alternately apply color and dispersant to create concentric circles. If desired, move to another area in the tray to make new circles with the same color or another color. When the desired amount of color has been added, a print can be made immediately or the colors can be manipulated gently by softly blowing on them, fanning them, blowing through a straw, or dragging a single hair through them. Be careful not to over mix the colors. To make a print, hold the paper on opposite corners. Lay one edge carefully onto the water surface and continue holding it as you slowly drop the paper onto the colored inks. Dropping the paper too quickly will disturb the design and cause air pockets to form, leaving voids in the prints. Let the paper sit for ten seconds and then carefully lift it. Only paper which did not absorb enough of the color will need rinsing. Lay the print on newspaper to absorb some of the water and then put it on fresh newspaper to dry. 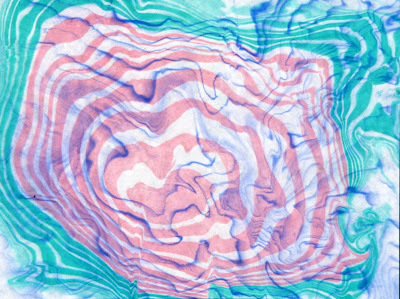 Drag a newspaper strip across the surface of the water to clean it for the next print. Have the children take turns observing and making Suminagashi prints. Note: In a second session, the dried prints can be marbled again. 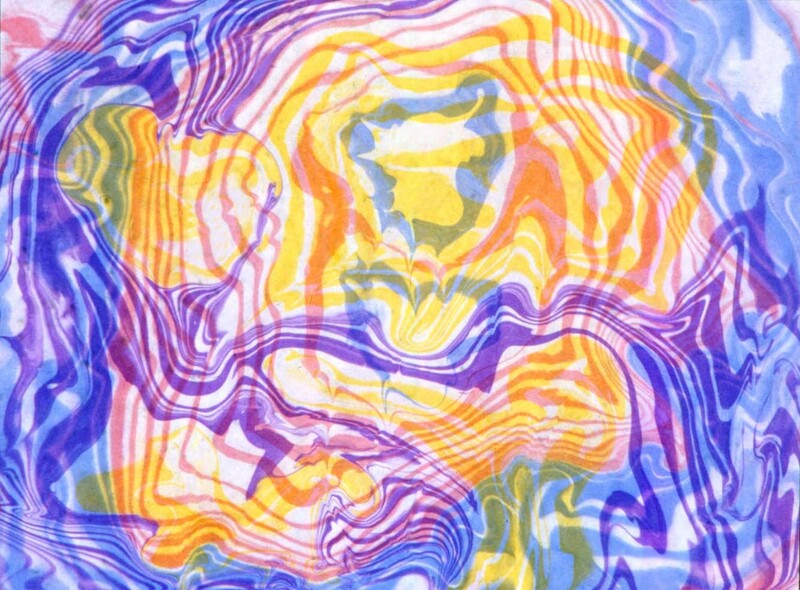 The interplay of lines from double marbling creates very interesting and complex patterns. All the prints in this lesson were marbled twice. Dry the completed prints and flatten them under some large books or iron them on a low setting. Using a clear or light colored tray will make it easier to see the colors on the water surface. If using drawing inks, be sure that they are the pigmented type. Speedball pigmented drawing inks were used in this lesson. Although the drawing inks and Boku Undo colors are non-toxic, they will stain so the children should protect their clothing. 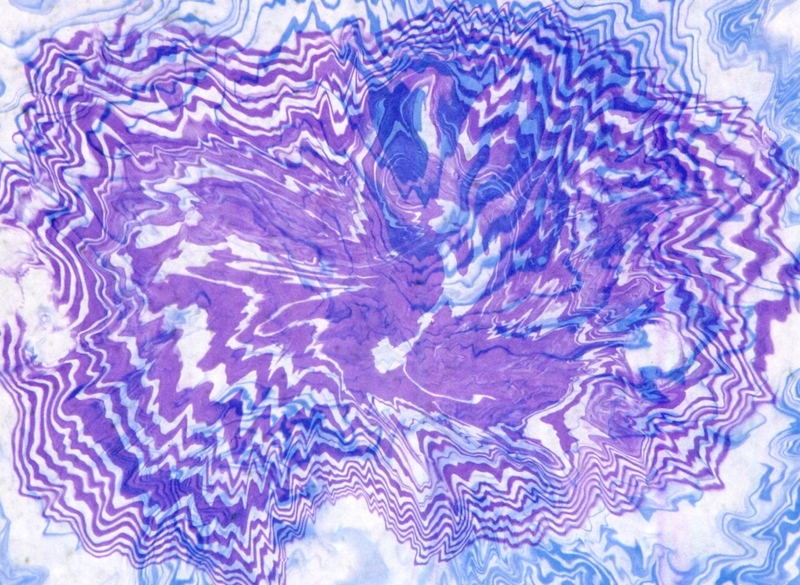 An accumulation of ink in the water will change the surface tension and the inks will no longer spread. When this happens, change the water in the tray. Be sure to test the paper ahead of time. Some rice paper will fall apart when wet and some printing papers are not absorbent enough. Copper plate paper absorbs the inks very well. However, because of its stiffness, it is more difficult to avoid air pockets when laying it on the water surface. If working with very thin paper, keep one edge dry so it can be lifted from the water without tearing. If using transparent rice paper, you may need to mount the dried print on another sheet of white paper to bring out the colors. Look for the natural flow of patterns created by the water. Compare the effects made by manipulating the colors. The red ink fell to the bottom of the tray. There is a big white spot in the middle of my print. If there is too much ink on your brush or you put more than the tip of the brush in the water, the color will drop to the bottom of the tray. It will stay on the bottom and should not interfere with your design. Be sure to use a newspaper strip to clean the inks from the previous prints off of the water surface. If the inks still don’t spread, we will need to change the water in the tray. It is important to lay the paper gradually over the surface of the water. If you go too quickly, you are likely to get an air pocket that will not come in contact with the inks, leaving a blank spot in your print.